Leaving Los Angeles, and coming back to Phoenix is one of the best decisions of my life. I grew up in Minneapolis, went to ASU, then moved to California, where I lived through most of the 1980s. I really hadn't planned to move back to Phoenix after my layoff in Los Angeles, I was just going to go see some old friends, good for the soul. So I visited Phoenix. What I saw amazed me. The first thing that struck me was the lack of traffic, and the amount of easy parking. Even after all these years it still makes me happy. Yes, I know people in Phoenix who say that the traffic is awful, and parking is difficult, but all they're saying to me is that they've never seen how awful it can be. I used to always carry a book with me in my car when I got on the freeway in Los Angeles, and when traffic stopped, I would put the car in park and read for a while. Yes, in park. Not bumper-to-bumper inching along, but completely stopped, in park. You just waited for traffic to begin to move. I read a few books that way! So as you can imagine a big plus of moving back to Phoenix was to be able to not get constantly stuck in traffic jams, and know that I would always find a parking spot wherever I went. Yes, there were times in LA that I would go to the mall, drive around and around and around, and then simply go back home. No parking in the lots, on the street, at all. The cost of living was so much lower than in California that it was as if they were giving stuff away. In an idle moment, I stopped at an apartment complex and inquired about the rent. My little California brain just about exploded! And then I heard the words "If you want to live on the golf course..." I could live on a golf course, in a beautiful apartment complex, for less than my horrible little hovel in California cost me! I signed a lease right then and there. Of course, the thing that worried me in Phoenix is that there's not as much work there as in Los Angeles. I was looking for corporate work and I could just about count all of the tall buildings in Phoenix, whereas I could never count them in the greater Los Angeles area. Yeah, that worried me a lot, but I figured with the cost of living so low I could figure something out. I did get a bit of culture shock moving to Phoenix. Now calm down here, I love Phoenix, but it felt, uh, kind of in the middle of nowhere. As if there should be tumbleweeds rolling down the street, and the sidewalks were rolled up at night. You gotta realize that LA was 24/7 commotion. I learned to slow down a bit myself and to this day I love the fact that in my neighborhood in Glendale the traffic lights on the half-mile streets switch over to blinking yellow in the wee hours. Not that I'm out much in the wee hours! There were things that I took for granted in LA that most people in Phoenix hadn't even heard of in 1989, like being able to pay at the pump at a gas station. In LA, I was in and out like a pit stop. In Phoenix, someone had to walk out of the garage, take my credit card, talk about the weather, and so I learned to set aside a big chunk of time to buy gas, usually on the weekends. I'm a techno-nerd and I liked ATM machines, and stuff like that. I never went anywhere in Los Angeles where I had to stand in line if I didn't have to. Of course the lines were never all that long in Phoenix, but I had lost my taste for standing in line at all. I was lucky, I did get a good job in Phoenix, at Valley Bank, right before they became Bank One. I worked in the tallest building in Phoenix, which was nice. And little by little the things that had made Los Angeles so attractive to me faded away. Of course I knew that there was no going back. A resume that says "Los Angeles" means a lot in Phoenix, but it doesn't work the other way around. Like everything else, it's what you value. I valued someday being a homeowner (which I could never have done in California) and I really don't need to be close to the movie and TV studios. I could never get comfortable in Los Angeles, and Phoenix felt right to me, and it still does. Image at the top of this post: At the Greens Apartments in 1990, right after I bought a nice new bicycle, for my commute to work. If you can stop looking at my short-shorts, you'll see the tee shirt said "California". 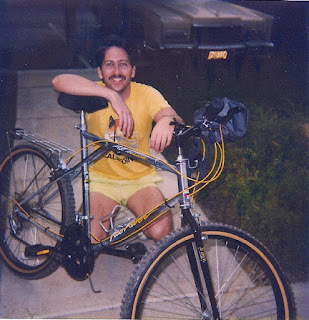 I don't have that bike, those clothes, or that mustache anymore.